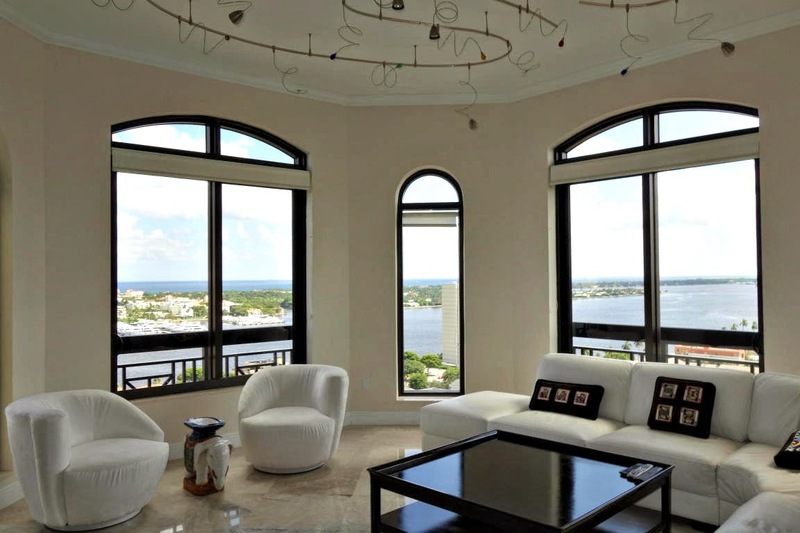 Perched atop the premier condominium community of One City Plaza in the vibrant city of West Palm Beach, Florida is this spectacular corner unit penthouse. Featuring 2 bedrooms and 3 bathrooms, this casually elegant One City Plaza stunner showcases a panorama of ocean, Intracoastal and city views throughout its 2,062 square feet of light filled living space. Effortlessly sophisticated, the impeccably designed interior showcases a number of chic features including a modern kitchen with stainless steel appliances, marble countertops, volume ceilings, upgraded lighting fixtures and marble flooring throughout. Additional luxuries include impact glass windows, 2 garage parking spaces and a spacious patio capturing forever views of the Intracoastal Waterway and beyond. 801 S Olive Avenue #1605 is located in West Palm Beach and is currently asking $1,399,900. This One City Plaza listing is courtesy of Ocean Via Realty Llc MLS# RX-10124862. One City Plaza is a premier luxury condominium community boasting a prized Downtown West Palm Beach, Florida address. Residents of this coveted pet-friendly community are pampered by an array of premium amenities including a generous heated rooftop pool, sauna and steam room, elegant clubhouse with built-in kitchen and media room, fully equipped fitness center, valet service, 24/7 front desk security and onsite management. Situated in the heart of Downtown West Palm Beach, residents of One City Plaza also enjoy an enviable location within walking distance to a number of the city’s signature elements including CityPlace, Clematis Street and Kravis Performing Arts Center. The world-famous shopping, dining and cultural attractions of Worth Avenue are also just minutes away on nearby Palm Beach Island.